Updating your basement is a great, space-creating alternative to adding an above-ground addition to your home. Extending your internal footprint by creating usable space in unused areas not only adds value to the overall price of your home, it can also add both private and communal living spaces for your family and guests to enjoy. 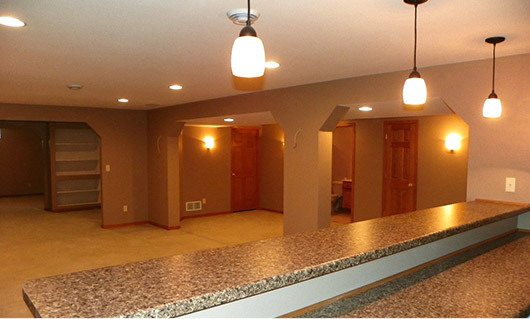 Basement remodels, in fact, are one of the most cost-effective ways to add attractive square footage to your home. 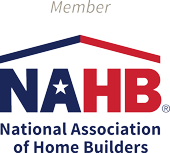 Updating your basement also gives you an opportunity to evaluate the foundation of your home. Finishing a basement does require moisture and water control. Our team will evaluate your foundation and check for any issues that may lead to moisture damage down the road. Finding and repairing cracks in the foundation and adding sump pumps and drain tile will not only add to the resale value of your home, but will also add to the overall safety of the house. 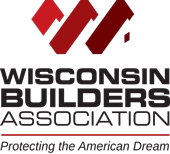 Finishing your basement can help prevent the growth and exposure of dangerous mold. 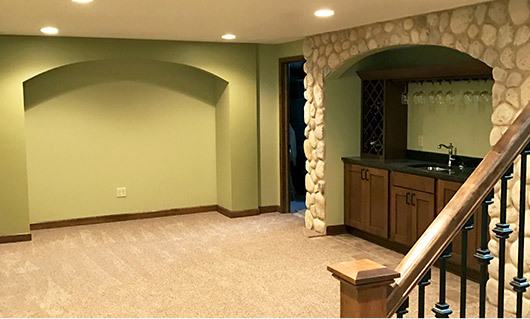 There’s no argument that adding additional living rooms, bedrooms, and bathrooms to your basement will add tremendous resale value to your home, and Renz Construction is ready to help you plan those extra living spaces. Basements, however, can be an excellent opportunity to truly customize your home, adding exciting entertainment and leisure features that were not included in the initial build of your home. Create a personalized living area for your family and guests – add an additional bedroom and attached bathroom to create privacy and a special experience for your visitors. Include a full-size bar, complete with electric and plumbing hookups for wine or keg refrigerators, regular refrigerators and freezers, and even sinks or dishwashers. Add space for your growing family – add an additional bedroom to accommodate a new baby or a parent or grandparent. Build out a full-size living room complete with electrical to incorporate speakers, WiFi, TVs, and more so everyone in the home can enjoy tv time. Extend plumbing to include additional powder rooms or full bathrooms. 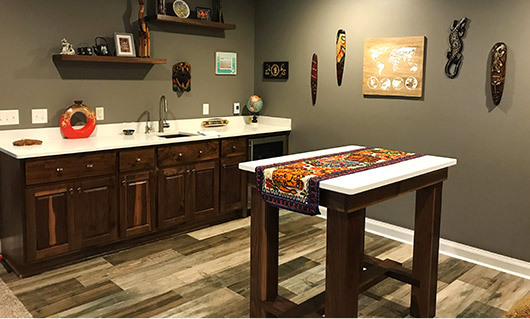 Have our custom carpenters build beautiful storage alternatives to keep your seasonal belongings organized in a temperature-controlled space.